How and why I became a sculptor is not of much interest. No one looking at my work will find me in it. I have nothing to say, I have no story to tell – at least not within the means of sculpture. What happens in the studio is not all that spectacular. You have no choice when it comes to actually making the works. Everything is decided in advance. The only thing you can observe in the studio is the production of the sculpture. But that can also be read out of the finished works. If you look at a work you can see how it is made. I have never separated the fact of the production of a work from the subsequent exhibition: because showing a work means making it. When you start on sculpture nothing is ruled out – big, small, bronze or plaster – these are not the only issues. There are no small or big works. The sculptures have the size and the dimension that they inherently need. There is no hierarchy among the works. Each has its own innate value. If the exhibitions are different, it means that the premises are different. 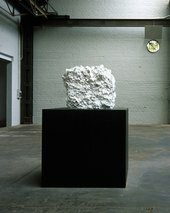 You can only look at a sculpture within the space surrounding it, whatever it is like because the actual material of the sculpture is the space. The space creates the sculpture and the sculpture creates the space. The various parts of the sculptures are simply placed on top of one another; they are never firmly connected to each other. The sculpture is self-contained. You do not need to touch a sculpture to get a better sense of it, to understand it, get closer to it. Similarly, I do not think that when you are looking at a plant you have to touch it to understand it or, if you see somebody, you do not need to touch him, either, to know him. The moment the sculptures are deposited in their place, they start playing with each other. Yes, that is sculpture’s game – space – the space that exists between the works. There are several ways of looking at a sculpture; but there is one that you can never adopt, and that is the viewpoint of the sculpture itself. It occupies a place in the space that is inaccessible to you. But for some works more than others it is also true that the sculpture suggests where you should place yourself. Plenty of things make up a sculpture but it is never a matter of ideas. The form is not more significant than the material and the material is not more significant than the form; in the end it is a unit. That is, the sculpture exists at the same time as the idea. The idea is the sculpture and the sculpture is the idea. I do not need an idea to start with a sculpture; that is not how it works. I do not have sudden inspiration, something speaking down to me from heaven: ‘Take heed, you must now make this sculpture, this way or that way.’ The moment the sculpture is there, it is simply there. 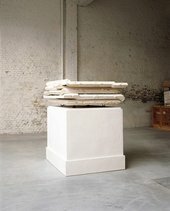 A plinth is also a piece of sculpture and it occupies just as important a physical space as the sculpture itself. No, I have never made plinths. 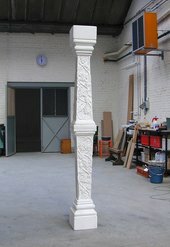 I make sculptures and all the sculptures I make are sculptures without plinths. As I am making sculpture I have to ask myself about the plinth. That is one of the first things the sculptor has to think about. If one thing is certain, it is the question of where a sculpture starts. It starts on the floor; it has no boundaries in terms of height and width but it does on the floor. That is the crucial point; the place where sculpture happens is on the floor. 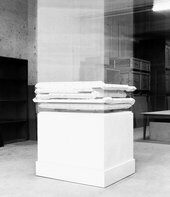 The sculptures consisting of two plinths on top of one another are works in which I take over something that already exists. When I started, I used plinths that were recognisable as real plinths. It was not a matter of constructing a geometrical form by placing a cube on a cube; the sculpture would not have worked like that. That is why I used the pilasters which are rather decorative. In fact, what interested me was not the decorative motif; that never interests me, it is not the subject of my work. I catch onto things that already exist but I do not think that for this reason they can be considered ready-mades. 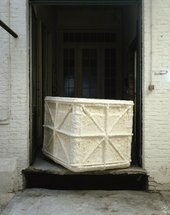 The plinth is something that has always been a part of art. The ready-made, on the other hand, is something that has been taken from the space outside of art and brought into it. I have put a plinth on a plinth and it has turned into a sculpture. I have never put something on top of something else and I have never thought about being able to make anything from that premise. The works are not really symmetrical; they are anti-symmetrical, especially if you bear in mind that the upper part has been placed on the lower, but headfirst. In this way what was previously on the right is now on the left and what was previously on the left is now on the right. It is a sculpture consisting of two parts but it is one sculpture. They are works that only exist once they are installed. If they are not exhibited, they simply stay as two plinths. So they have to be placed in relation to each other in order to exist as sculptures. In the works with Styrofoam the important thing is that the traditional relations between sculpture and plinth are switched. In the more traditional relationship, the plinth is more solid than the sculpture standing on it. Here the opposite is the case. What is made visible is weight; the sculpture is characterised by the weight of the upper part. It is a matter of material, a matter of density, a matter of volume; and again; it is not ideas, it is the things that make up a sculpture. These works have something to do with the motif of the plinth on a plinth. And, to some extent, the motif of the combination of positive and negative is also present. One volume derived from its correspondence to another. Part of my work consists in reflecting upon the methods of producing sculpture. Traditionally the sculptor obtains his positive form from a negative form and afterwards he saves this negative form so as to provide more positive forms. In this way, he keeps control of his production. However, I make sculpture in which I present both the positive and the negative. Consequently, it is impossible to use the negative again because it has become a part of the sculpture itself. You therefore have a positive displaying a negative. What is outside in the positive is inside in the negative. In fact everything is switched, the treatment of the outside corresponds to the inside. I make a sculpture that refers back to another sculpture. And I do not choose just any sculpture. I assume a reference made by other people before me so I am influenced by those sculptures. 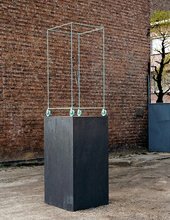 My sculpture does not refer to a plinth, it refers to a sculpture; it refers back to the sculpture standing on that plinth. The material my sculptures are made of is the same as that of the sculpture if refers to, the one it points to. The title indicates the material, two different dates, a place and, finally, the title of a sculpture as well as the title of my sculpture. If you just read the title, you have not seen the work; but if you have seen the piece and have not read the title, you have not seen the work as a whole. A title is indispensable, and even Untitled is a title. My sculptures refer to the works of other sculptors but also to my own. This means there are backward glances from sculpture to sculpture. One sculpture alone cannot exist. A single sculpture does not say anything yet. The works form a network but they also work as individual articulations. If I make a sculpture it is defined by the sculpture I made before; and it defines the sculpture I shall make afterwards. All sculptures constitute one large ensemble. Some works have wheels but they do not stand on wheels. Rather, the wheels are part of the sculpture itself. If you stand in front of these works you can see that they do not completely conceal the floor underneath them. For me, it was always clear that a sculpture has a front, a back and various sides. The wheels give the work a forward and backward orientation and in this way they at once define and limit its sideways extension. The wheels are there and they indicate a movement but the movement does not actually have to occur. The sculpture does not have to roll along in order to work as a sculpture. There is not an engine or a switch to set the work in motion or switch if off again. I have also always been convinced that a sculpture should be motionless and wrapped in silence. There are a lot of people who think my work is about absence. 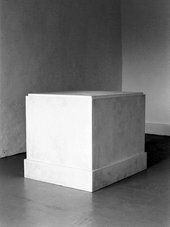 They make it very easy for themselves and say: ‘The guy’s working with the plinth, so he’s showing something that is not there, so he’s showing the absence of the sculpture that he’s quoting. OK, I’ve got it, that’s it.’ And then they turn away. But my subject is really about presence. The presence of what? The presence of my work, of my sculpture. We have known for a long time that the spectator also makes a contribution to the work. The work only exists when it is exhibited. It is therefore every time it is exhibited and every time you look at it you remake it. But you cannot leave a sculpture and say, ‘fine, I know it’. No, you do not know it, or at least, that is not the problem. Seeing a work again, you always recreate it. Nature? It does not feature in my work. What could be there, what is actually present in my work, and what becomes visible in it, is the human body. Consequently, the sculpture has the measure of the body that has worked on it and made it. The body, yes, the human body. What will be made in the future will, in principle, be the same as before. I think you do the same thing over and over again. All the sculptures I have made say the same thing; that is what makes up sculpture. 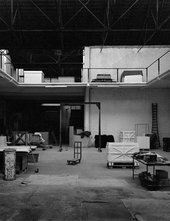 Nonetheless, each work can be very different, different in terms of material, size, scale, expanse etc. A sculpture allows us to see a sculpture. Sculpture exists in its own right. It is not a film, a text, a photograph … Nothing can replace the real encounter with a work. You have to walk up to a sculpture. The text in this paper is based on the statements in the film, 123 plans sur la sculpture de Didier Vermeiren by Elsa Cayo, Tri Films, Paris, 1988, 16 mm, colour, 26 min. The individual passages have been shortened and reworked. 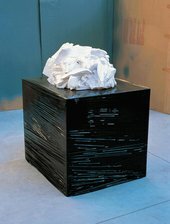 Didier Vermeiren, ‘Je travaille sur la présence’, in Tate Papers, no.8, Autumn 2007, https://www.tate.org.uk/research/publications/tate-papers/08/je-travaille-sur-la-presence, accessed 19 April 2019.